January 14, 2016 - No Comments! Trevally have separate sexes. Many common species appear to reach reproductive maturity at lengths between 35 and 56 per cent of their maximum size. The giant trevally, for example, grows to about 160 cm and 80 kg over a lifespan of about 24 years and reaches reproductive maturity at a length of about 60 to 95 cm when they are between 3 and 5 years old. The smaller bluefin trevally, which grows to 90 cm, reaches sexual maturity at between 30 and 40 cm at an age of about 2 years. Many species travel long distances to breed in large numbers (in spawning aggregations). The areas at which they gather (spawning sites) are often at the outer edge of fringing reefs or near reef passages. These aggregations often occur as waters become warmer and at times are related to the cycle of the moon. During spawning, each female ~ releases many thousands of eggs into the water and these are fertilised by sperm released by males. The fertilised eggs hatch into very small forms larvae that drift in the sea for periods often greater than a month. Less than one in every thousand of the small floating forms survives to become a young fish juvenile. When the drifting forms settle out as juveniles these may enter inshore shallow water and move out to deeper reefs as they grow. Less than one in every hundred juveniles survives the 2 to 5 years that it takes to become a mature adult. The giant trevally, Caranx ignobilis (also known as the giant kingfish, lowly trevally, barrier trevally, ulua, or GT), is a species of large marine fish classified in the jack family,Carangidae. The giant trevally is distributed throughout the tropical waters of the Indo-Pacific region, with a range stretching from South Africa in the west to Hawaii in the east, including Japan in the north and Australia in the south. It is distinguished by its steep head profile, strong tail scutes, and a variety of other more detailed anatomical features. It is normally a silvery colour with occasional dark spots, but males may be black once they mature. It is the largest fish in the genus Caranx, growing to a maximum known size of 170 cm and a weight of 72.8 kg. The giant trevally inhabits a wide range of marine environments, from estuaries, shallow bays and lagoons as a juvenile to deeper reefs, offshore atolls and large embayments as an adult. Juveniles of the species are known to live in waters of very low salinity such as coastal lakes and upper reaches of rivers, and tend to prefer turbid waters. The giant trevally is a powerful apex predator in most of its habitats, and is known to hunt individually and in schools. The species predominantly takes various fish as prey, although crustaceans, cephalopods and molluscs make up a considerable part of their diets in some regions. The species has some quite novel hunting strategies, including shadowing monk seals to pick off escaping prey, as well as using sharks to ambush prey. The species reproduces in the warmer months, with peaks differing by region. Spawning occurs at specific stages of the lunar cycle, when large schools congregate to spawn over reefs and bays, with reproductive behaviour observed in the wild. The fish grows relatively fast, reaching sexual maturity at a length of around 60 cm at three years of age. 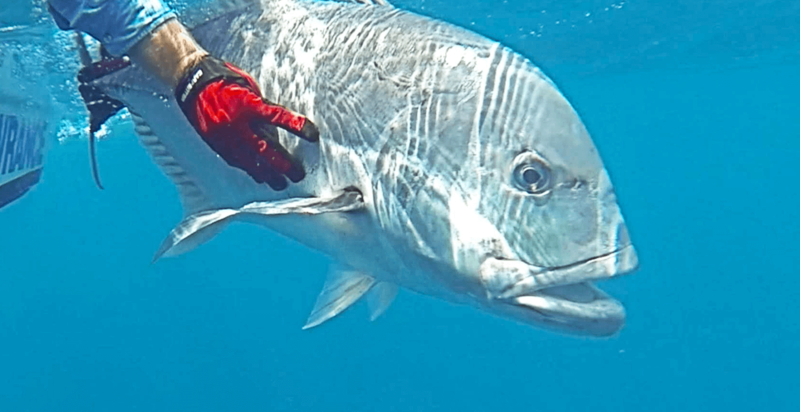 The giant trevally is an important species to recognised gamefish, with the species taken by nets and lines by professionals and by bait and lures by anglers. The species is considered poor to excellenttable fare by different authors, although ciguatera poisoning is common in the fish. Dwindling numbers around the main Hawaiian Islands have also led to several proposals to reduce the catch of fish in this region.